Another Good Read – Fix Bayonets! I will add this to my reading list. I can only read a book like this now and then. They tend to haunt me. One of the most powerful books I read about a group of Marines was written by a Vietnam veteran about his time there. It’s called First Force Recon Company, Sunrise at Midnight by Dr. Bill Peters. I have another book, that isn’t very engaging in the way some of the books are, but a chapter of it details the circumstances (fire fight) around the death of a particular Recon man in Vietnam. I have a photo of that Marine and his friend (sitting together in Vietnam) in my office. It was given to me by his brother. Neither he nor his friend made it back. I look at that photo every day…It’s one of the more powerful objects in my life (along with a $3.00 Marine Corps/American flag pin that was also a gift). Anyway…I’ve gone way off topic…but I guess all that was to say that I appreciate greatly that some are willing and able to tell of their experiences. There is much to learn and to think about in all of them. I consider stories like this national treasures and it’s good of you to pass this one on. Thank you. I am not an avid reader, Dr., but when the Colonel recommends a book about this kind of topic, I usually get it. My hardcopy from Amazon arrived yesterday (about $10). Although I have a Kindle, I prefer paper. The result? I couldn’t put it down. While my daily schedule is not as packed as yours nor filled with workouts, I finished it in less than 24 hours. I also recommend it. I have long meant to read this book. 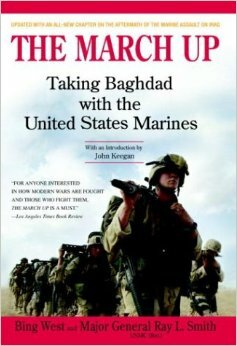 A quick note: the title, “The March Up,” seems to be a reference to a work by the 5th-4th century BCE Greek soldier Xenophon. His “Anabasis” or “Going Up” chronicles his own flight with an army of Greeks from the pursuing Persians. A friend passed along a first hand story from his friend who was working a Marine checkpoint in Iraq. A bus full of women was blasting toward them and refused to yield after warning shots so they were forced to take the bus out with a .50. Upon examination there were no explosives or anything that indicated the bus would have been a threat other than barreling through the checkpoint. This man wept when he told my friend the story. No doubt it will be with him forever. Hell, I’ve got memories that aren’t even measurable compared to that which will haut me forever. So many ways to offer compassion to these men and women in combat service. There is no shortage of bravery under fire with the 1st Marines… nor with any other Marine outfit. Chesty, Basilone, Mad Dog… I shall order it on Kindle. You’ve never steered me wrong. Indeed, the fog of war. People die in wars. If anybody should feel guilty about civilian casualties, it should be the failed political leadership that put the Marines into the line of fire in the first place…and the civilians. I feel great sorrow for those in battle if a civilian life is taken; that Marine may battle it for the rest of their lives. I loved your last story, by the way.